I love chiles rellenos, but frankly, the idea of beating 12 egg whites and then dipping roasted, cheesy peppers into them and deep-frying the whole thing sounded kind of messy and elaborate—especially since I was only cooking for 2. This roasted version is healthier but doesn’t skimp on flavor. Smoky cumin and earthy sweet potatoes come together with soft jack cheese, making this version less overwhelmingly rich than traditional chiles rellenos. The salsa’s sweet grapefruit and creamy avocado are perked up by spicy peppers (though you could omit these if you aren’t a fan of spicy). If you’re vegan, swap out the cheese for beans. 1 cup shredded jack (or other soft white) cheese $4 for 8 oz. 1/8 tsp cumin $1.50 for 1 oz. To roast the peppers, turn 4 burners on the stove to high heat (gas is best but electric will work). Place 1 clean, dry pepper directly on each burner. Leave it there, untouched, until the entire side is black and the thin layer of skin on the outside of the pepper has begun to separate. Use tongs to rotate the peppers until all sides have blackened. Carefully remove and transfer to a plate. Under cool running water, gently use your fingers to remove the outer layer of skin (it should come right off--if it doesn't , dry your pepper and return it to the burner until it's fully-roasted), and carefully remove the seeds that are attached to the stem internally. Once all peppers are skinless and seedless, transfer to a clean, dry surface. To prepare the filling, heat the olive oil over medium-high heat in a large frying pan. Add the sweet potatoes, 1/2 the onion, garlic, 1/2 the cilantro and cumin. Cook for 6-7 minutes, stirring frequently or until sweet potatoes are cooked through. Remove from heat and transfer to a bowl. Allow to cool for 5 minutes. Once cool, season with salt and pepper to taste and stir in cheese. To assemble the peppers, run a knife down the side of each pepper, lengthwise. Use a spoon to stuff each pepper with the vegetable-cheese mixture. Place, open-end-up on the baking sheet. Repeat with remaining ingredients. Bake for 10-12 minutes, or until cheese is bubbly and melted. 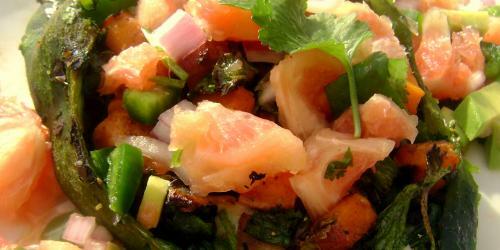 While peppers bake, combine the avocado, jalapeño, grapefruit, the remaining onion and cilantro and the sugar or honey. Toss well and set aside. To serve the peppers, place a hot pepper on a plate and garnish with the salsa. For those working without gas burners, I roast my poblanos in the oven. Turn your broiler on high and put the oven rack on the highest level you can. Line a cookie sheet with parchment paper (for the mess, it’s fine if you don’t), and place washed and dried chiles in a single layer. Place on the highest rack and leave the door open just a bit while you roast them. If you don’t leave the door open, you’ll get an overwhelming blast of chile smoke in the face. Not good. It takes about 7-10 minutes per side. I put them in a bowl with a towel on top and find that that helps ease the skin off, but that’s not really necessary. While you don’t get that same smokey flavor, the green chiles are still flavorful enough to not miss the smokiness too much. Yum! These sound so good and perfect for a weeknight. Bookmarking right away. Almost hidden on the dial are an on/off indicator for the alarm, as well as a power reserve indicator. There is no running seconds hand, but rather a centrally mounted alarm setting hand (that has the clef counterweight).